Thank you to to the 2018 Vancouver International Dance Festival, for inviting our student writers out to this 3-week festival of culturally diverse contemporary dance. You can see the full calendar of VIDF Events here. Originally composed in 1913 by Igor Stravinsky, The Rite of Spring is a well-established piece whose vibrant and energetic musical score is known for provoking raw emotions from the audience. When first played, The Rite of Spring instilled the audience with so much passion that a riot nearly started during the concert. Today, Shen Wei challenges the pre-defined, musical masterpiece and choreographs an entirely new piece of work. 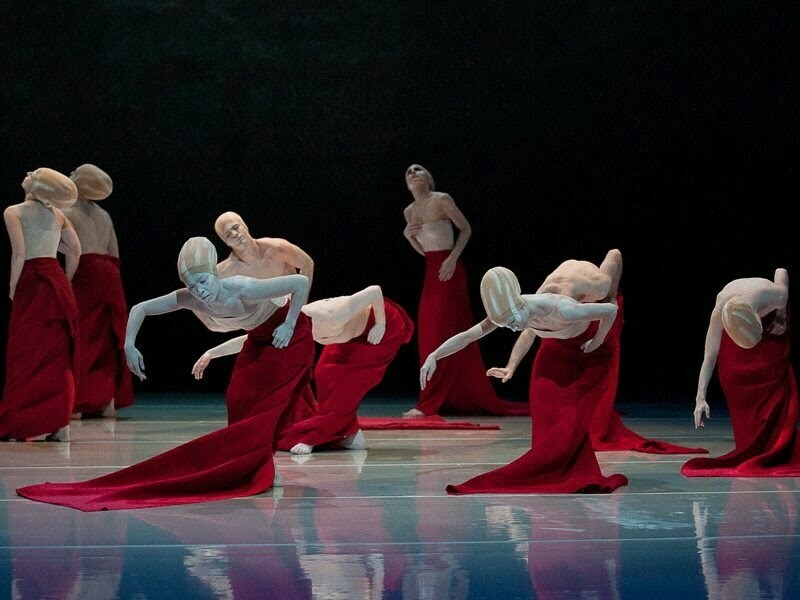 With influences from traditional Chinese, European and American cultures, painter and choreographer Shen Wei has created a true work of art. The show starts with an empty, dark-lit stage. As the music begins to play, dancers appear to the audience, gliding methodically into their spots. The scene is surreal and dreamlike; with each dancers’ slow, calculated movements demanding your attention. Once in place, the dancers pause, just long enough for us to realize, before springing their bodies into wild, chaotic positions. A wonder fills the audience –how can each dancer move in such an unpredictable way without colliding with another? The audience begins to understand the choreographed balance between the chaos and control as each strong character comes together to create an inspirational story about struggle and sacrifice. This version of Rite of Spring is a daring composition that leaves an overwhelming visual and emotional impact on the audience. Wei’s version is a riveting and startlingly imaginative work that satisfies the audience yet leaves them anticipating the second half. Shen Wei is currently working on choreographing the remainder of the Rite of Spring- taking extra time to create an equivalently striking masterpiece. So instead of continuing the story after the intermission, Shen Wei Dance Arts presented Folding to the audience. In Folding, Shen Wei attempts to tell his audience that there is more than just life: in his bigger picture, enthralling, pale figures with beehive-shaped heads float around the stage in long red and black skirts to beguiling, rhythmic chanting. From here on, Shen Wei strategically incorporates elements of movement, music and décor to intrigue the audience. The dance itself is full of pure movements that are simply composed to create an elegant and striking image. As the dance progresses, the audience becomes increasingly invested –curious to learn more about the ghost-like figures and the story that they are telling through their movements. There seems to be an eerie similarity between the figures and humans, but the similarity is so abstract that one cannot draw a conclusion. Instead, the audience becomes completely absorbed in the dance; unable to look away even if they wanted to. Indeed, Shen Wei’s abstract thinking presents a thrilling show to his audience that forces spectators to question our purpose and impact on the world today. Stephanie grew up in a small town and has enjoyed adjusting to life in Vancouver. She like to keep an open mind and learn about other people’s lives. When Stephanie is procrastinating from her studying she can be found falling at ice rinks or attempting to ride tandem bicycles at Stanley Park.